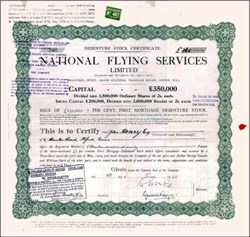 Beautifully engraved certificate from the National Flying Services Limited issued in 1929. This historic document has an ornate border around it. This item is hand signed by the Company’s Directors and is over 72 years old. The Desoutter I monoplane was built by Desoutter Aircraft at Croydon. It was based on the Dutch designed Koolhoven FK41. Forty-one British built Desoutters were produced between 1929 and 1931. They were used mainly as air taxis or ambulances. Nineteen were acquired by National Flying Services at Hanworth for use on instructional, taxi and pleasure flying work.